5 Responses to Your Favorite Super-Secure Email Service? 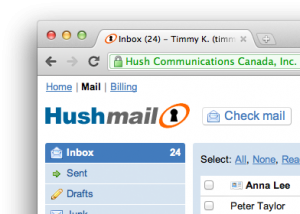 Hushmail is not 100% secure. Zimmerman sold it to a large corporation, and now it is just like the others, legal in countries whose governments demand a backdoor. It is better to go with the illegal services, at lease those that are illegal in the USA and Europe. We’re starting to use Virtru (https://www.virtru.com) on top of Gmail. It’s a pretty slick encryption service – works in the Gmail browser window but also has an Outlook add-on. Recipient receives a link and has to unencrypt in a browser window. Our apologies if we came off as sounding judgmental against Microsoft and Google. By using the phrase, “made a deal with the devil,” we just meant to say that word on the street was that they had given back door access to certain governments in order to gain access to a particular grid. But one Brigada reader felt that by using such strong language, we biased the item and if that happened for you, please forgive us. Although our preference would have been for them to stand their ground, we can see their reasoning (to follow what they understood to be the law of the land in that country). If you say that Google and Microsoft have given access to governments in a way that is addition to, or not mentioned in their security disclosures, then please document this. Many people do use these services and trust their disclosure statements.